Small is beautiful – this expression serves Malta all too well. Everywhere is near enough and one minute one can be in an urban centre and the next out in the outdoors where human intervention is minimal. 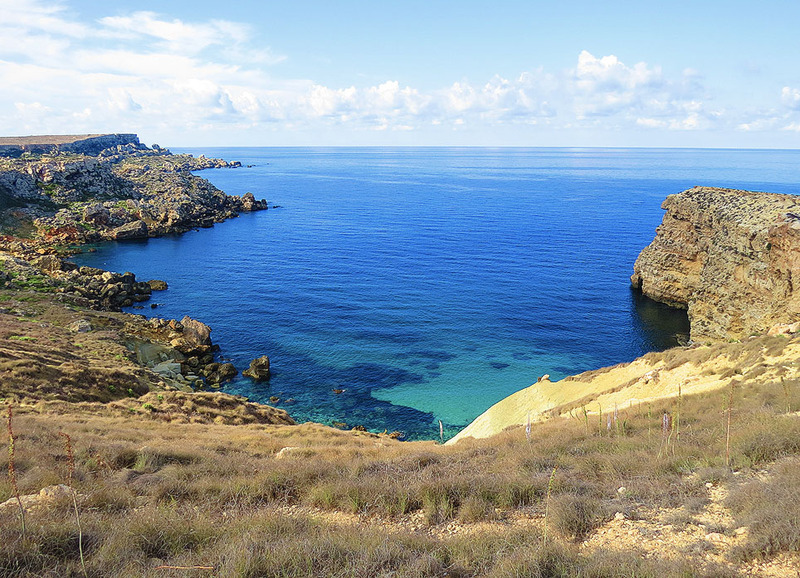 In the cooler months Malta offers a diversity of trekking opportunities – here we have a look at one that is easy enough and offers an interesting potpourri of sights. On the left going up the hill to the Red Tower outside Mellieha is a disused road that leads to what was once a holiday village – short-sightedly built on clay and now very much in ruins. 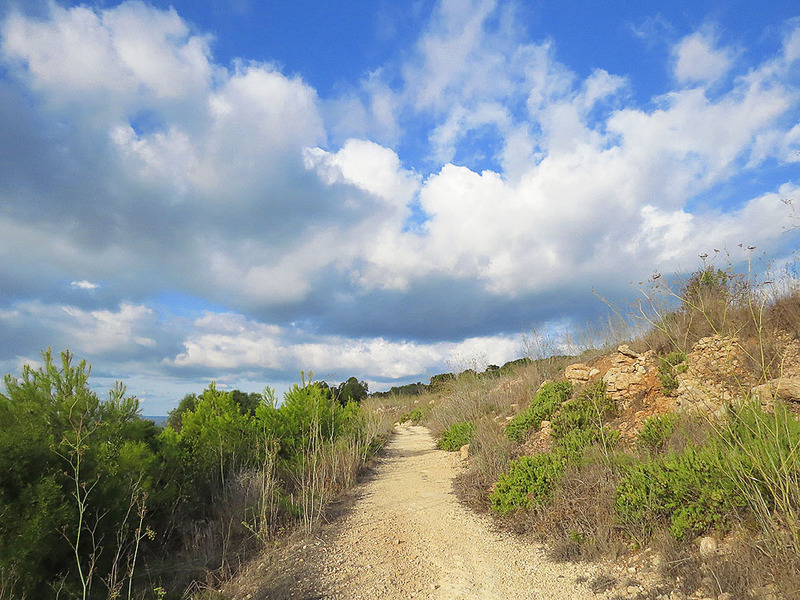 From here a walking only trek leads through Foresta 2000 – an indigenous wood created by local NGO’s in recent years and which attracts an array of bird life along with the nearby Ghadira Nature Reserve. At the end of this wooded area one gets a view of the Qammieh promontory with its limestone shelf next to the sea and a deep ravine cutting into the cliffs. Further south of the plant is a wild stretch of garigue and the sea below in this area has a lovely shade of light blue in places – white sands at the bottom reflecting a colour akin to Comino’s Blue Lagoon. 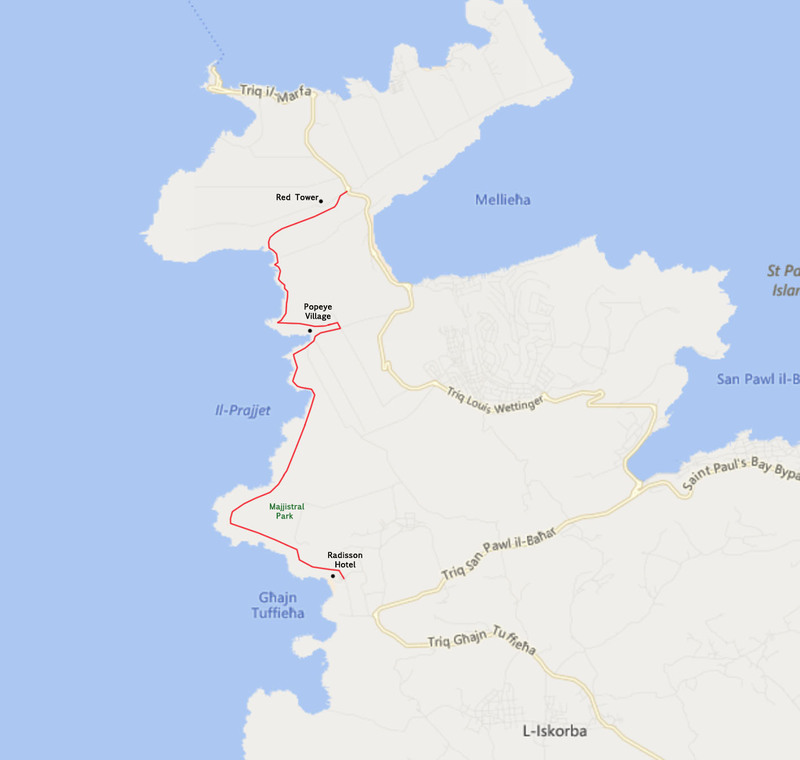 This stretch ends in a jagged promontory – a much eroded one with the remnants of rockfalls by the coast. From here veer inland until a farmers track is reached: go down it and join the road that abuts at the end of it. Fifty metres on is one of Malta’s more curious attractions. Way back in 1980 the director Robert Altman chose this remote bathing spot to build the village of Sweethaven when he came to film his musical Popeye which starred Shelley Duvall and the late Robin Williams. The film flopped rather badly in cinemas but the film set was never dismantled – and true to Maltese entrepreneurial spirit this remnant of a failure was magically turned into a roaring success. 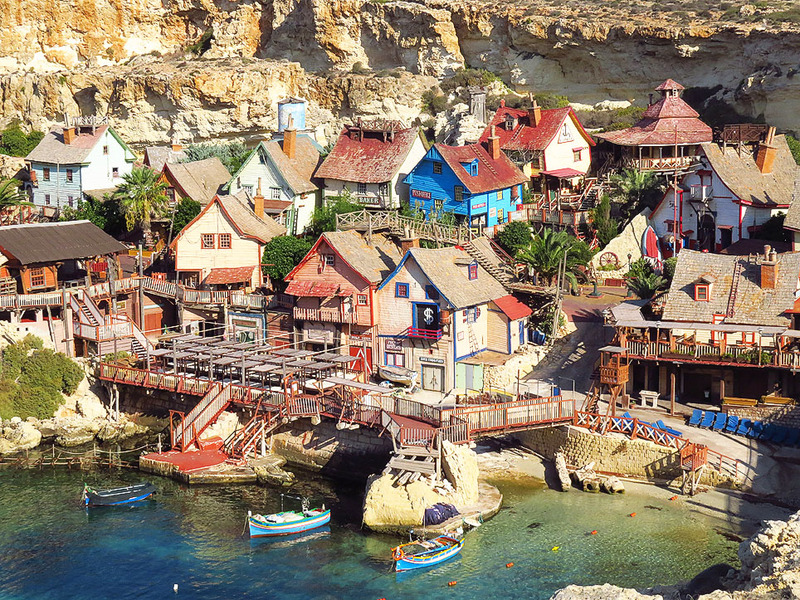 Popeye Village is reckoned to be the most visited tourist attraction in the islands – and naturally it is a magnet for all who remain children at heart. Arguably the best views of Sweethaven are from outside the attraction itself – a trek hugging the bay’s southern arm gives the best views. This trek continues along the cliffs until another lovely bay comes into view. 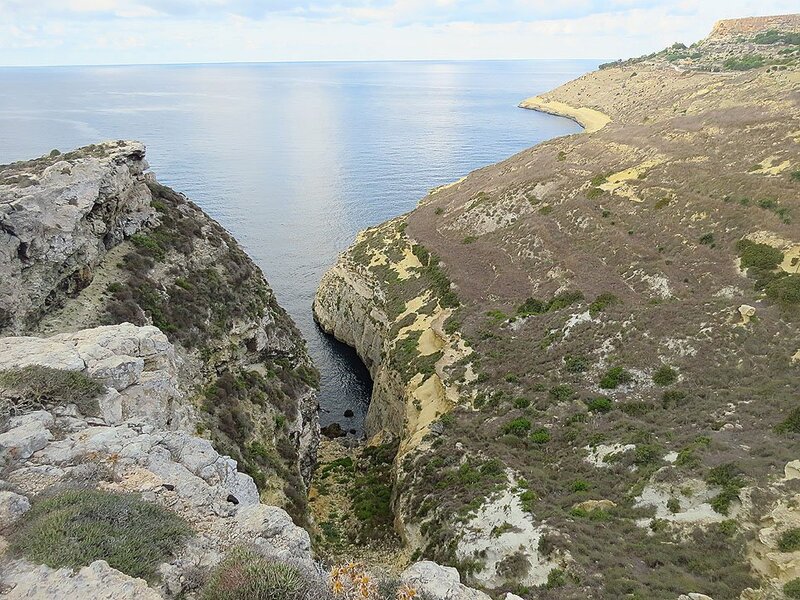 This is called Rdum id-Delli (the shaded cliffs) and is in fact the northernmost part of the Majjistral Park – a vast expanse of garigue about six times the size of Valletta, and designated as a national park in 2007. There are numerous trails to cross the park southwards towards Ghajn Tuffieha – the best being once more the cliff edge path which affords the best views. Once the Radisson hotel comes into view one can take a path that goes round the hotel’s edge to get to Ghajn Tuffieha Bay. This trail takes about three hours to complete and is a fairly easy one – although terrain is not the smoothest in places. Both start and end points are served by public transport. Buses from Valletta, Bugibba and Sliema stop at Bus Stop Qammieh just below the Red Tower. From Ghajn Tuffieha there are direct buses to all three locations as well.